With the Memorial Day holiday just days away, Express Glass is clarifying its holiday hours. While many competitors shut down for the holiday, Express Glass wants to reassure busy Miami businesses and residents that the company call center will be open. May 25, 2016 - Miami, FL. 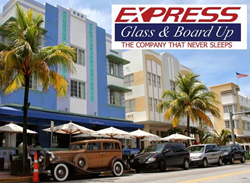 Interested parties can find the company phone numbers, not only for Miami but all of Miami-Dade county at http://www.expressglassfl.com/miami-glass-window-repair/. There in addition to general information on glass repair, one can also find an online form to contact the company if email is easier. The Northeast has New York City, California has Los Angeles, and Florida has Miami. Each area has a 'city that never sleeps,' and accordingly the residents of each city expect commercial and residential glass repair services that also 'never sleep.' Even on busy holidays such as Memorial Day, Independence Day, or Labor Day, Miami businesses and homeowners expect to be able to pick up the phone or their Web browser and contact a reputable glass company for emergency repairs. Accordingly, Express Glass is announcing it will indeed be open 24/7 on that busy holiday, occurring Monday, May 30, 2016. Express Glass and Board Up Service Inc. is a family owned and operated glass repair business with more than 20 years of experience. Their professional technicians and the large variety of inventory make Express Glass the top glass repair service. If customers are looking for Fort Lauderdale glass repair or glass repair coupons as well as Miami and Lake Worth, Florida, glass repair, please reach out to the company for a free estimate. Glass repair coupons include; 24/7 emergency glass repair, sliding glass door repair service and window repair and replacement for homes and businesses. Express Glass professionals will handle any glass replacement situation efficiently. Home or business glass repair is the company's main priority.